As the “New Materialisms” discourse continues to gain traction across multiple fields of inquiry, we come together as scholars of Xicanx/Latinx Studies, Native American/Indigenous Studies and postcolonial African Studies to open up a space of dialogue on the subject. Bringing into question the newness of “New Materialisms” invites us to critique some of the larger problems we encounter in this emerging literature; namely Eurocentrism, colonialism, universalism, and related erasures of race, class, gender, sexuality and other dynamics of power. 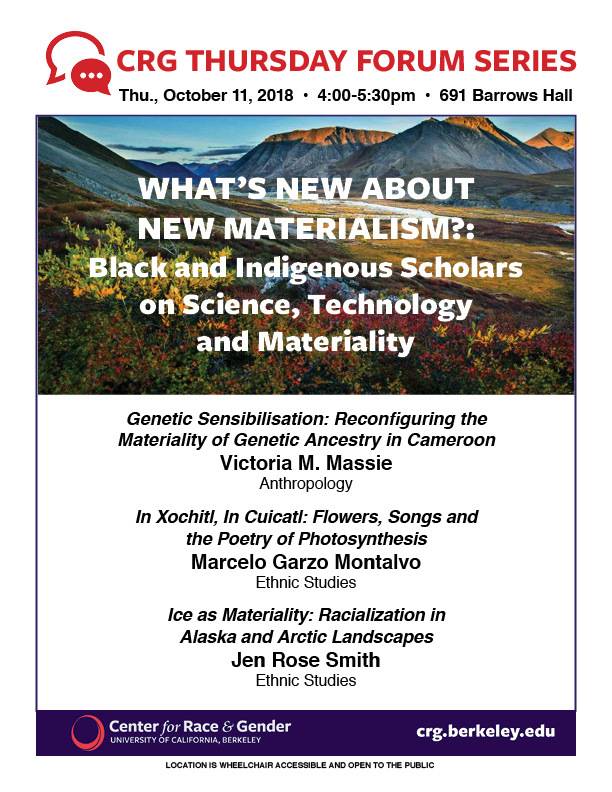 As both an engagement and a departure from “new materialist” conversations, this panel will unpack questions of materiality, history, epistemology and power as they emerge in our projects regarding Indigenous sciences, the co-production of land and race in Alaska, and the politics of diasporic return through genetic ancestry testing. Jen Rose Smith (Eyak, Alaska Native) is a Ph.D. candidate in the Department of Ethnic Studies. Her dissertation “Indeterminate Natures: Making Land, Race, and Indigeneity in Alaska,” traces historical and modern articulations of land, race, and indigeneity as the terms have been co-constituted under colonial conditions. She analyzes how these terms have been made, and the means by which they have been reproduced materially and discursively in culture, science, and law. In historicizing colonial frameworks of land, race, and indigeneity, Jen attends to how indigenous peoples in Alaska and the Arctic have strategized and mobilized their ongoing claims and relations to land, water, air, and ice. Jen completed her undergraduate degree in English with an emphasis in Literature and the Environment at the University of Alaska Southeast, and received her master’s degree in Ethnic Studies from UC Berkeley. She is a recipient of the UC Berkeley Chancellor’s Fellowship, the Ford Foundation Predoctoral Fellowship, the Ford Foundation Dissertation Fellowship, and was a Graduate Fellow with the Joseph A. Myers Center for Research on Native American Issues. Victoria M. Massie is a writer and Ph.D. Candidate in Sociocultural Anthropology with a designated emphasis in Science and Technology Studies at UC Berkeley. Her dissertation, “Assembling Genetic Ancestry: Race, Return, and the Materiality of Home examines how the contemporary ideas around race and the politics of belonging through genetic ancestry shift as this biotechnology is mobilized to forge diasporic ties in Cameroon. Her work has been supported through the Wenner-Gren Foundation, Fulbright-Hays Doctoral Dissertation Research Award and National Science Foundation, as well as awards from the UC Center for New Racial Studies, UC Berkeley Chancellor’s Fellowship, and the UC Berkeley Center for African Studies. She was also awarded lifetime membership to the West African Research Association in 2015. Additionally, Massie is an essayist and editor whose work has been featured on The Intercept, Vox, Complex Magazine, and Catapult. Marcelo Garzo Montalvo (Mapuche, Chilenx) is an award-winning scholar-activist, classically-trained experimental musician, Aztec ceremonial dancer and Ph.D. Candidate in Comparative Ethnic Studies at UC Berkeley. He is the recipient of the Chancellor’s Fellowship for Diversity and Inclusion and the Institute of Noetic Sciences Consciousness in Action Award. His academic work has been supported by the Tinker Foundation, the Institute for the Study of Societal Issues, the Center for American Cultures and Engaged Scholarship and the Center for Latin American Studies. He is an active member of multiple on-campus working groups, including Performance in the Americas, the Color of New Media, and Peripheral Futures. As a scholar and educator, he regularly teaches and guest lectures in university and K-12 classrooms, presents at academic and activist conferences, and facilitates popular education workshops with community-based organizations. He has worked on staff and served on the board of directors for multiple Bay Area-based community food justice organizations including the People’s Grocery, Planting Justice and Pie Ranch. He has also been active as a healing justice organizer, co-founding the BadAss Visionary Healers and serving on the organizing committee for the Men’s Healing Clinic Collective. As an artist and musician, Marcelo is an alumnus of the Emerging Artists Professionals Fellowship and the Yerba Buena Center for the Arts Labor and Ecology Think Tank. His art, research and activism focuses on decolonization and inter-generational, inter-cultural healing.